Amateur fantasy and monster movies made with love! The above video is my latest project; a very short adaptation of Harold Munro's prose poem "Overheard On A Saltmarsh." This short piece seems to be a perennial anthology favorite, and I've heard a few people say they read it in their schoolbooks. Basically, the poem is an argument between a goblin and a nymph, overheard by whoever scribbled down the text. In that context you're not really supposed to see the arguing creatures, only hear them somewhere out in the marsh. 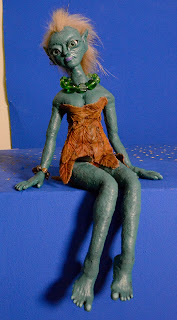 Of course, it was no point for me to make a film without showing the characters. I've recently replaced my old tired PC laptop with a brand spanking new iMac, and I wanted to give my After Effects a proper test run on my new hardware. This short film seemed to be a good subject. 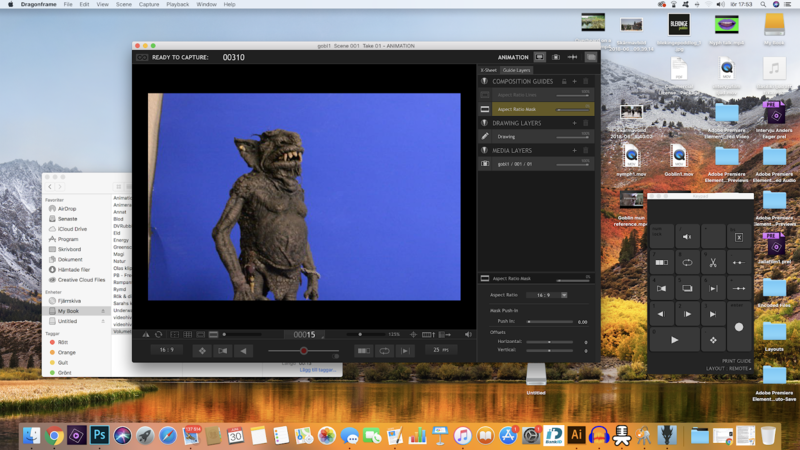 And having bought a Mac also meant that my usual animation software of choice, StopMotionPro, was out since it won't run on Macs. Instead I invested in Dragonframe, and this film also gave me the opportunity to test that out as well. Both characters are speaking in the film, and their mouths were animated, but in two different ways. 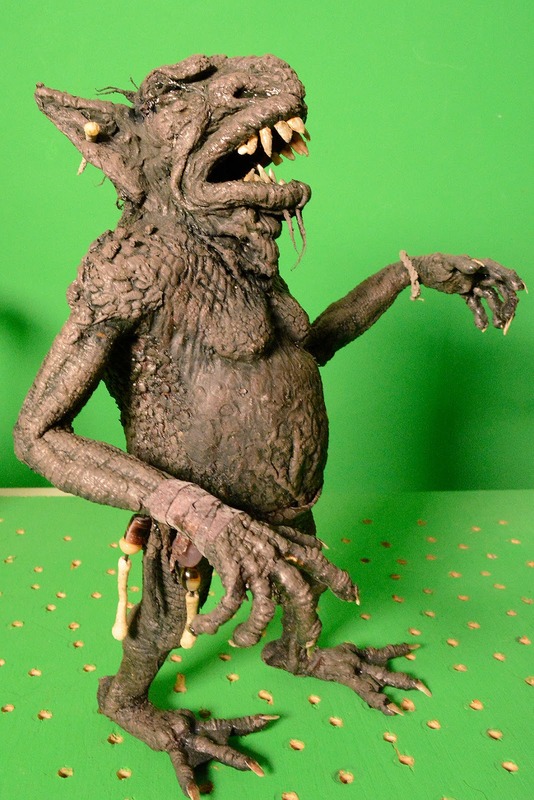 Let's start with how the goblin was made. The two artists who have defined the look of goblins and nasty fairies in pop culture more than anyone else are probably Arthur Rackham and Brian Froud. I tried to stay away from their interpretations and come up with something of my own, a creature which looked like he could live his entire life in the swamp. 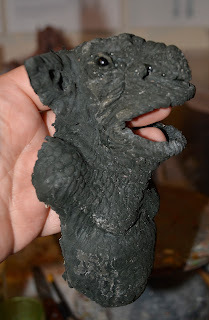 I made this goblin a sort-of mix between a toad and a rodent. 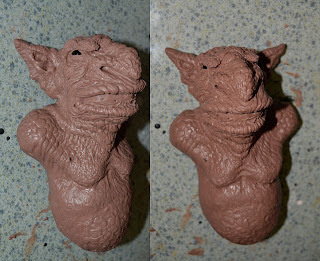 This head and torso is sculpted in Monster Clay medium grade. 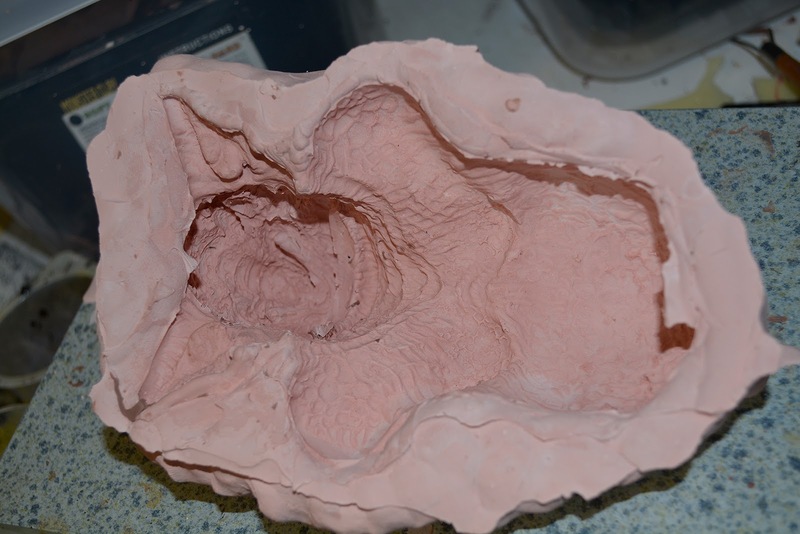 Hard dental plaster was used to create a sturdy mold over the sculpture. Tinted latex goes into the mold, keeping the latex thick at certain spots and thin at others. The ear isn't cut off in this photo, it's just flopped down over my hand. I've also glued a small black plastic bead in place as the eye. 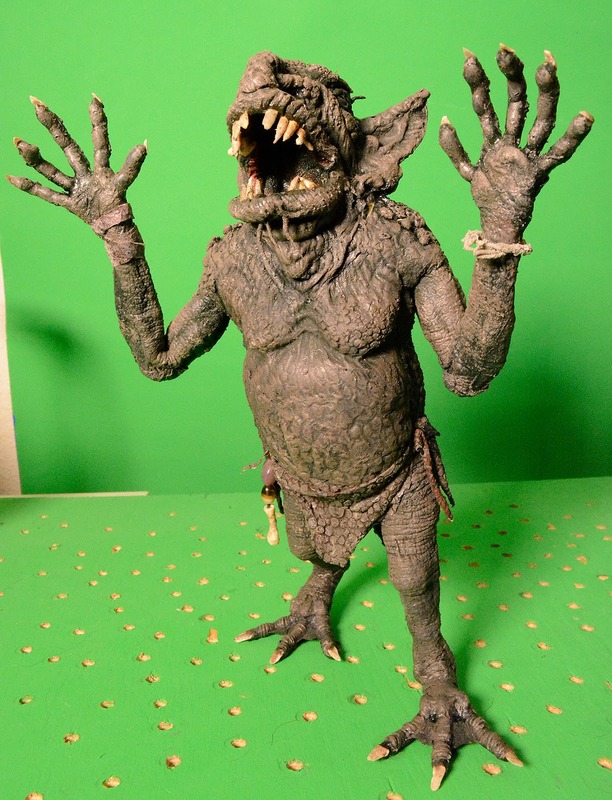 The goblin's mouth needed to be very flexible, since he had lots to say in the film. To give me the best flexibility when animating I simply made a loop of aluminum wire wrapped in soft string and then covered with latex. In this photo I haven't joined both ends of the wire into a loop yet. The joining was made using a mix of super glue and baking soda. 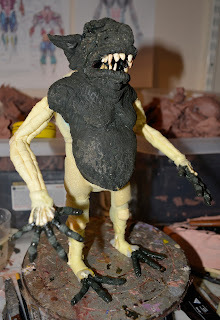 The armature for this puppet was actually built up one bit at a time, adapting it to how the padding of the torso turned out. 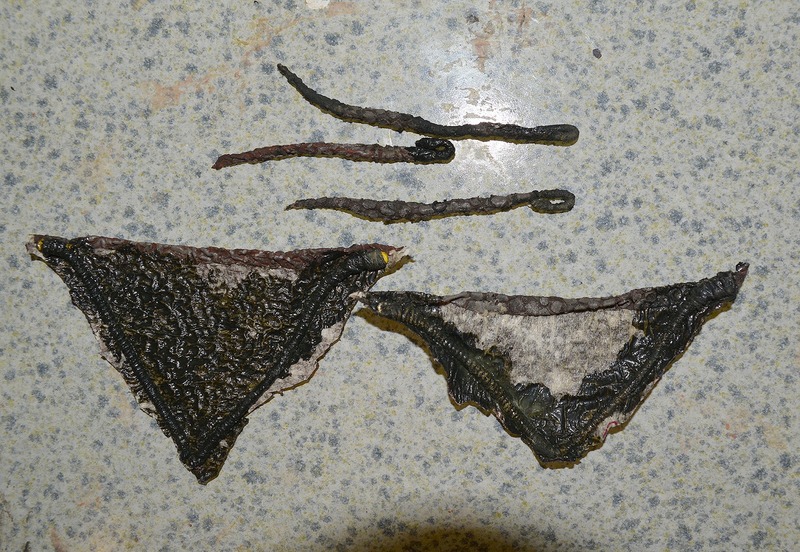 The padding is bits of polyurethane foam, some of it soaked in latex. 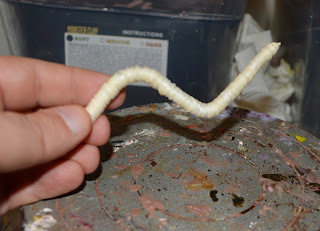 The teeth are cotton dipped in latex and shaped with my fingers. 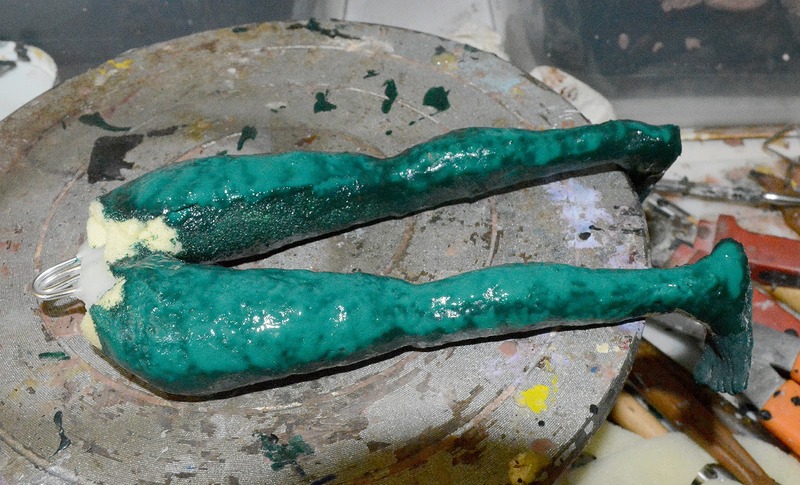 They're attached using more latex as a bonding agent. 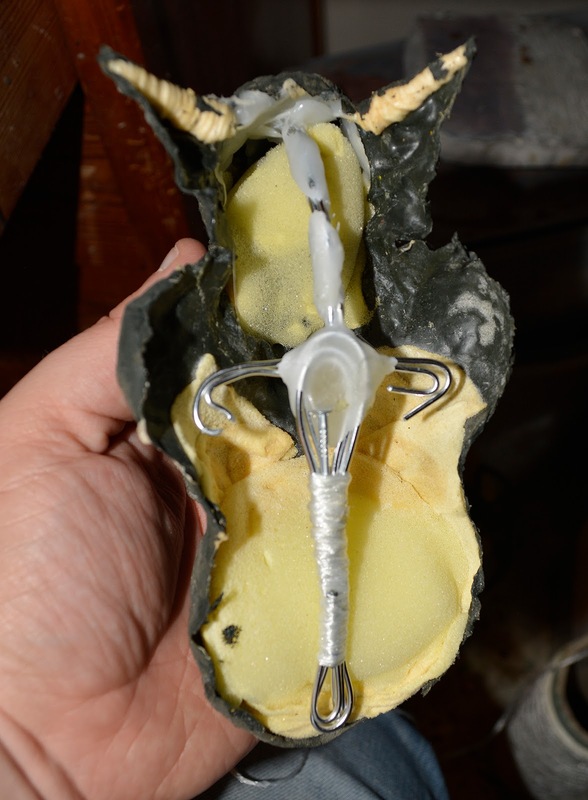 The aluminum mouth wire is now stuck to the inside of the lips. 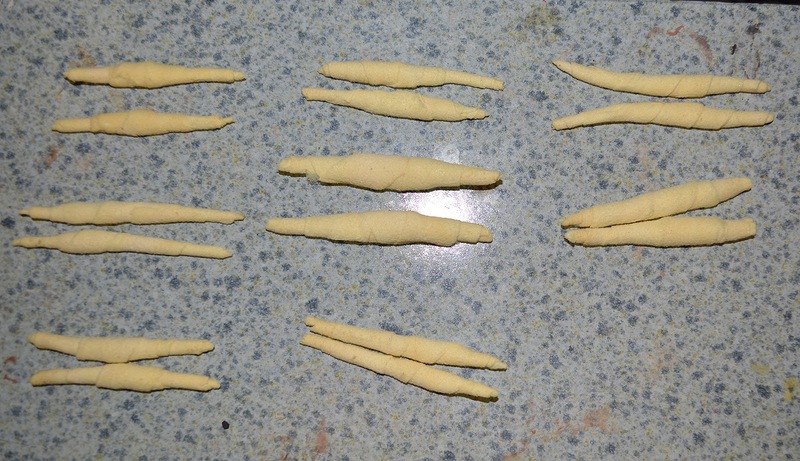 These little yellow sausages are actually strips of thin polyurethane foam, soaked in latex, allowed to dry and then rolled up. 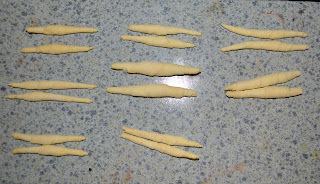 I'm using them as muscles to create organic shapes on the arms and legs. The good thing about this particular material in comparison to using rolls of cotton or strips of ordinary polyurethane foam, is that it will compress slightly, but mainly retain its shape. 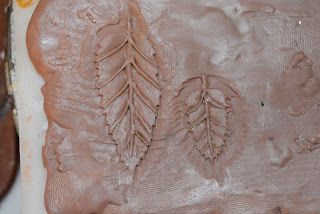 Which means that you can bend the limbs and have them look more natural and organic than when using those other mentioned materials. 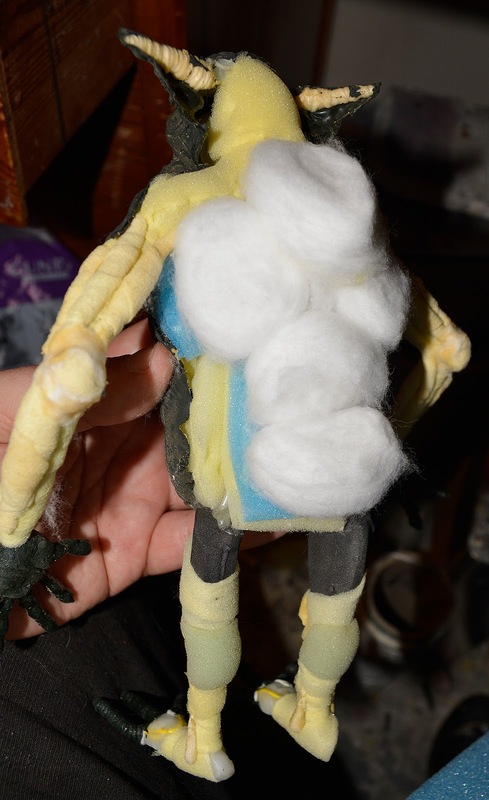 To pad out the back of the puppet, making it look bulkier without adding a dense material, I used cotton balls. 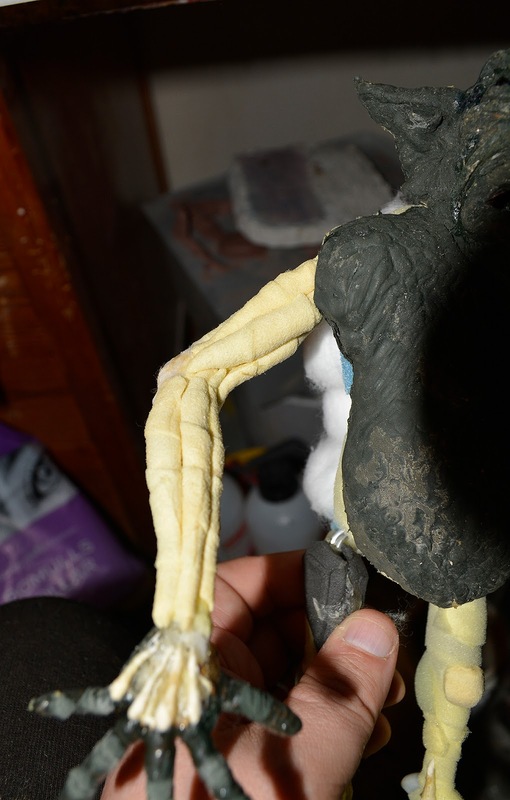 These will create a bulbous bulk on the puppet's body, but still allow the spine to bend and be animated very well. This is how the foam sausages look when attached as muscles on the arm. Here the whole puppet has been padded with latex-soaked foam and regular foam. 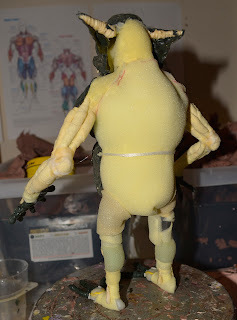 The latex skin is pinned down to the foam using liquid latex as a glue. The cotton balls on the back are covered with a thin sheet of foam. The goblin covers his modesty with a loincloth made from lizard skin (bits of latex cast into a skin mold). Parts of these latex bits are supported by thin aluminum wires, so the loincloth sections can be animated, swaying to and fro as the goblin moves. The finished goblin puppet is dry brushed with tinted latex, and weird bristles or hairs made from cotton dipped in latex now grow from the character's head. Also, bits of extra adornments have been added in the shape of small beads and bones made from cotton and latex. Like with the goblin, I wanted to make something slightly unusual with the nymph. 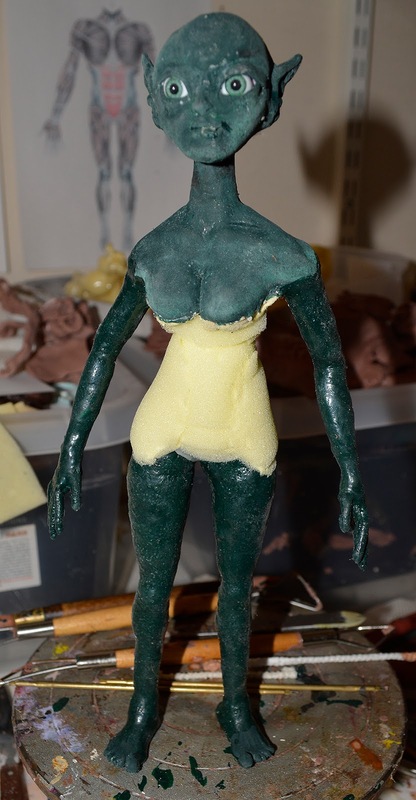 In the end I think she turned out fairly conventional. 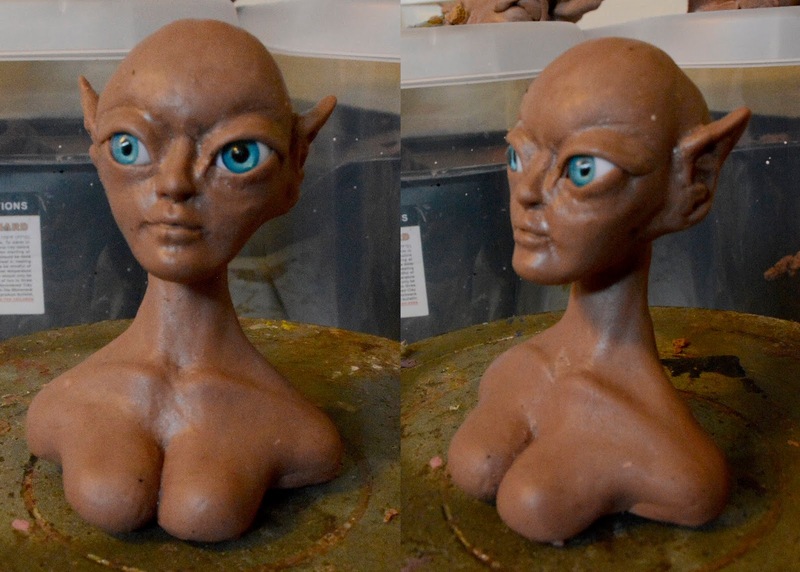 All of her appearance is built up around her eyes, which are acrylic doll's eyes. 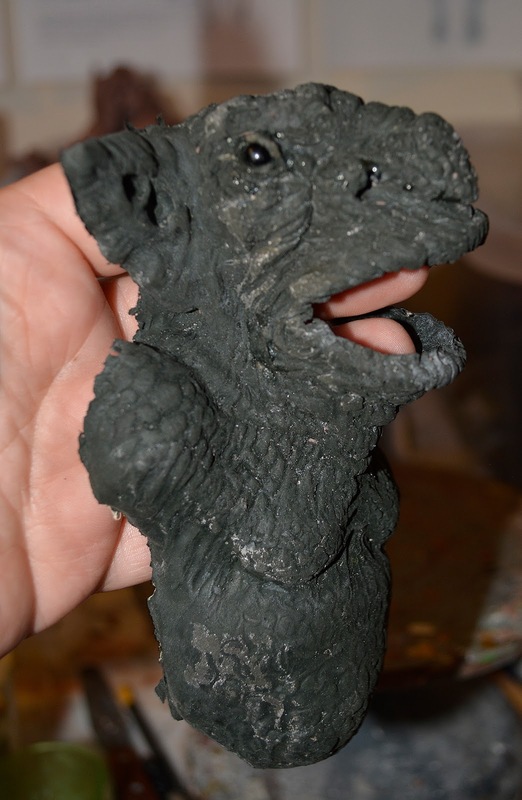 I sculpted this bust in medium grade Monster Clay. 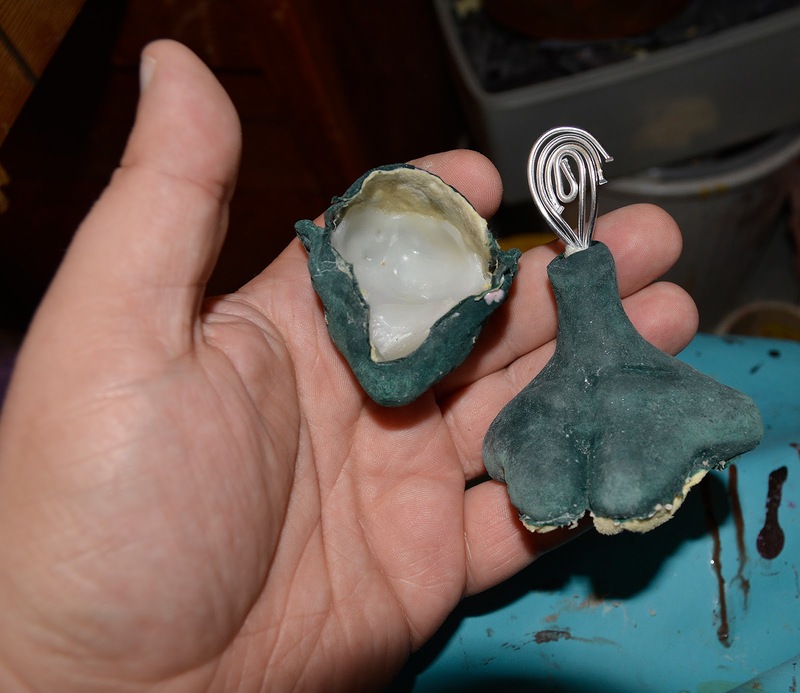 For the casting procedure I separated the neck and the head for easier casting. 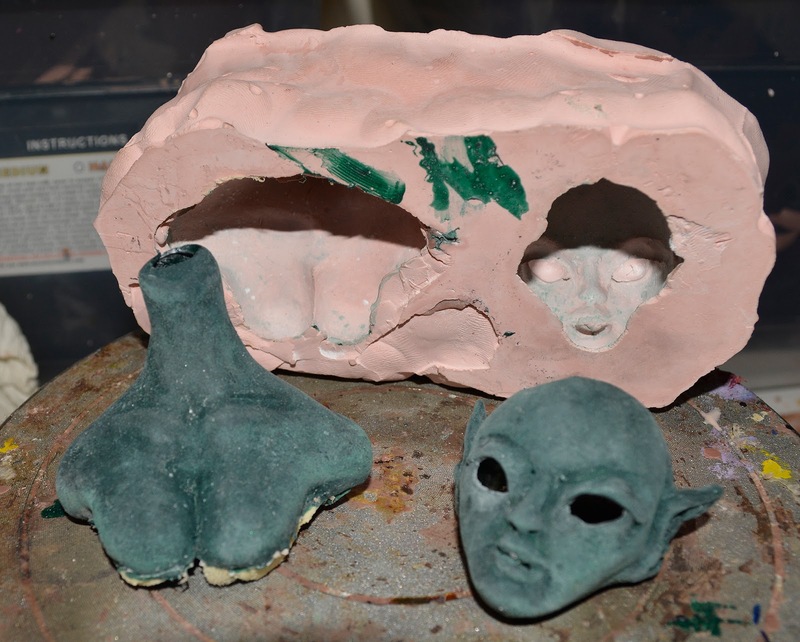 Tinted latex created the skins of the pieces, and thin strips of polyurethane foam soaked in latex were pressed into these latex castings before they were removed from the plaster mold. 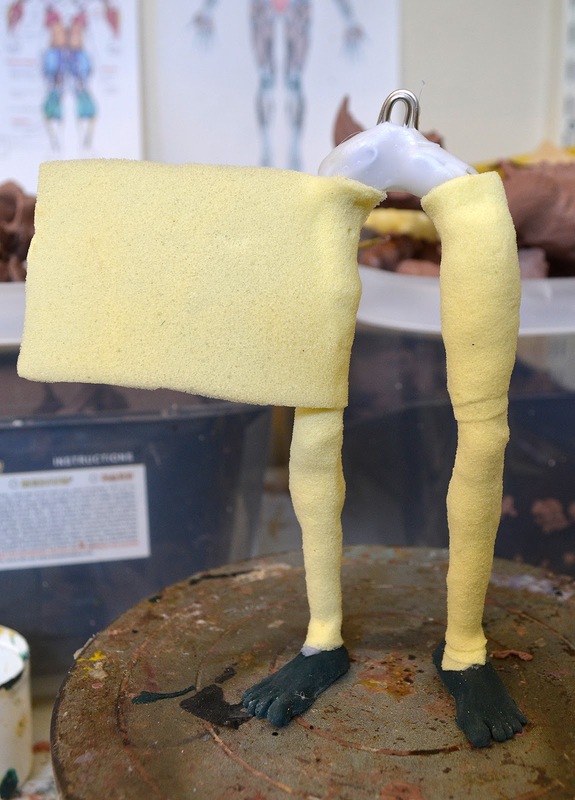 Latex-soaked foam is pressed together around the armature, slowly shaping subtle muscles, which are then covered with tinted latex. 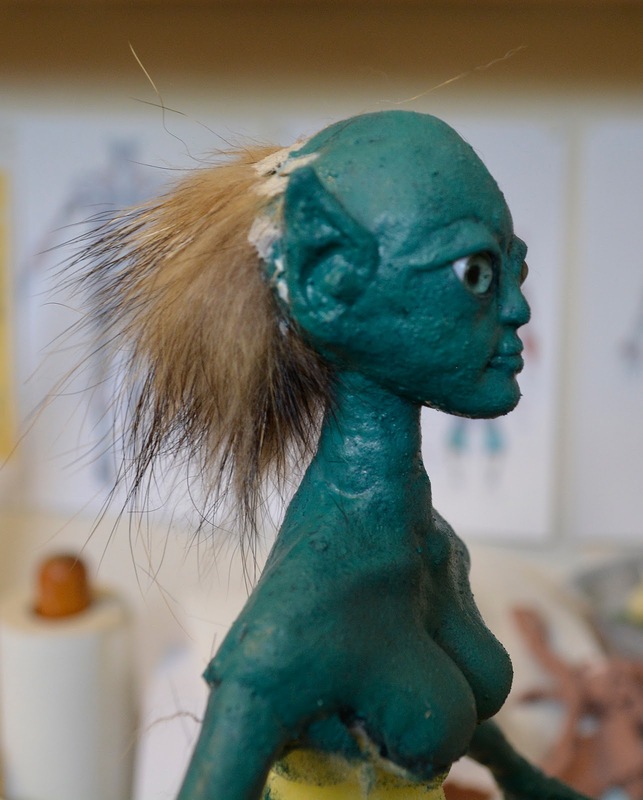 Here's a snapshot of the process. The legs are being covered with wrappings of foam that have been soaked in liquid latex and allowed to dry. 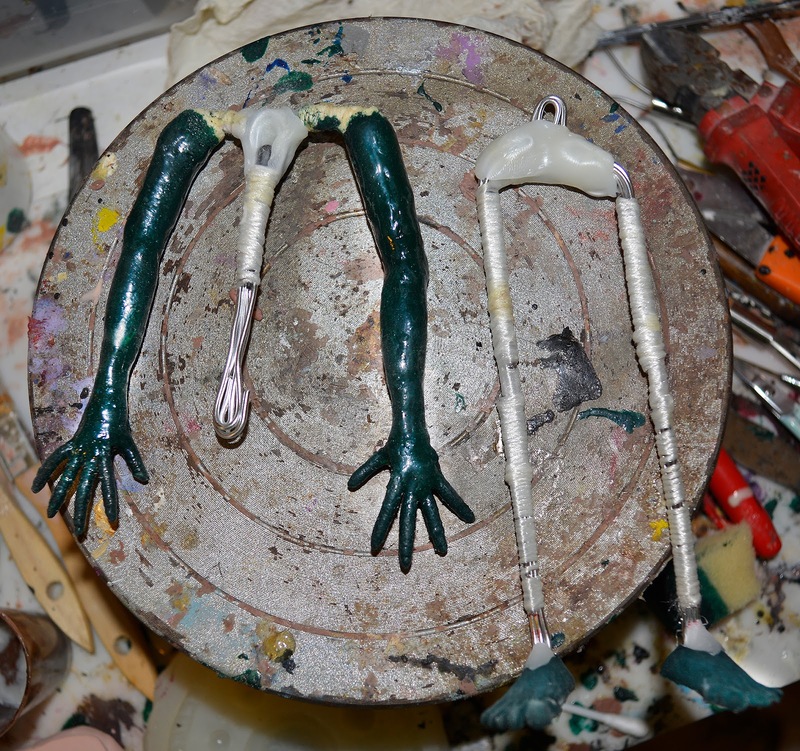 The legs and arms are given circa five layers of tinted latex, puddled on using pipe cleaners as brushes. 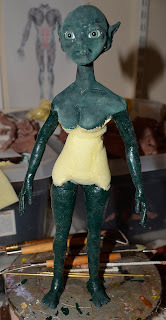 I'm speeding up the drying process using a heat gun on its lowest setting. Since her torso won't be exposed, no skin is added there. To create a spiky, unkempt hairstyle I'm cutting bundles of hair from the collar of an old coat, using latex to glue it down onto the head. When the latex dries it'll turn transparent. The nymph has a small dress or top made from brownish leaves. 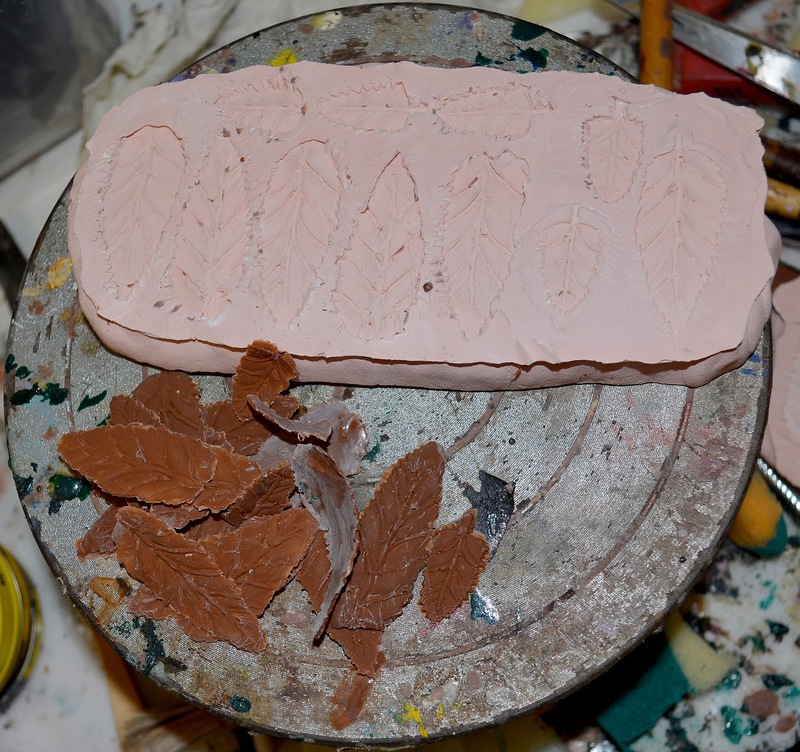 I sculpted a few leaves in clay and created a plaster mold over them, so I could cast a bunch of them in latex. The finished dress is given a dash of acrylic airbrush paints painted on with an ordinary brush to create some shadows within the shapes of the leaves. This puppet does not have any attachment points in its feet, like most of my puppets (the goblin, for example). 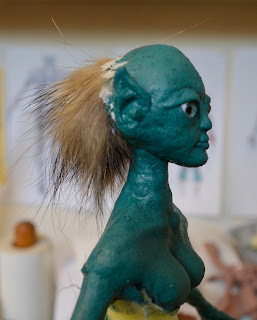 Instead she has a t-nut in her posterior, so I can have her sit absolutely still when animating her upper body. The glass beads, over which the characters argue, are from a bag of trinkets I've collected over the years for use in my puppet projects. The nymph's mouth is not animated on the puppet, but separate elements created in Photoshop are animated to move in sync with the speech of the character. I'm using photos of a real mouth. 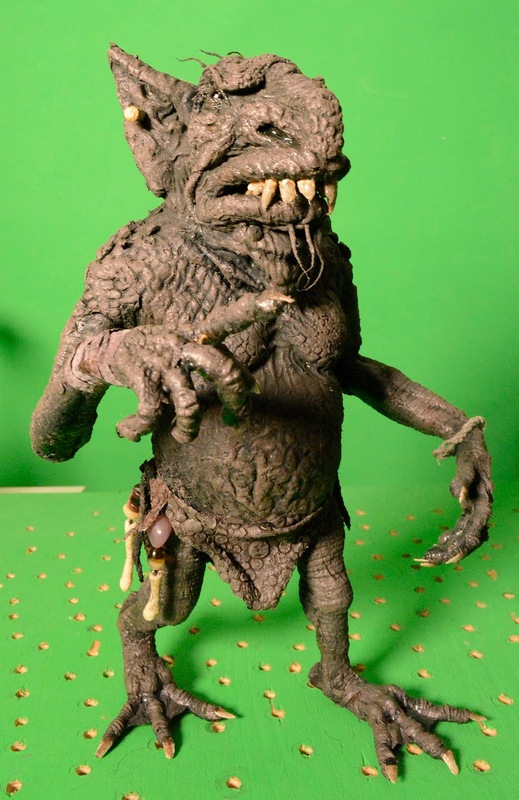 As for who's talking, I'm doing the voice of the goblin, pitched at a lower register, and the nymph is an Irish lady doing voice overs for fun and profit. The actual marsh is represented by footage of a British marsh by a lake, and the close-ups are reeds and grass that grow around a pond in my garden. This was a fun project to do, though the process of syncing the animated mouths with the recorded speech took quite some time. It's not 100% perfect, but it does get the point through, I hope. I'll do some more folklore-themed projects this year. It's a subject very dear to my heart, and I haven't touched on it in my videos as much as I'd want, so far. Lovely work, Richard! 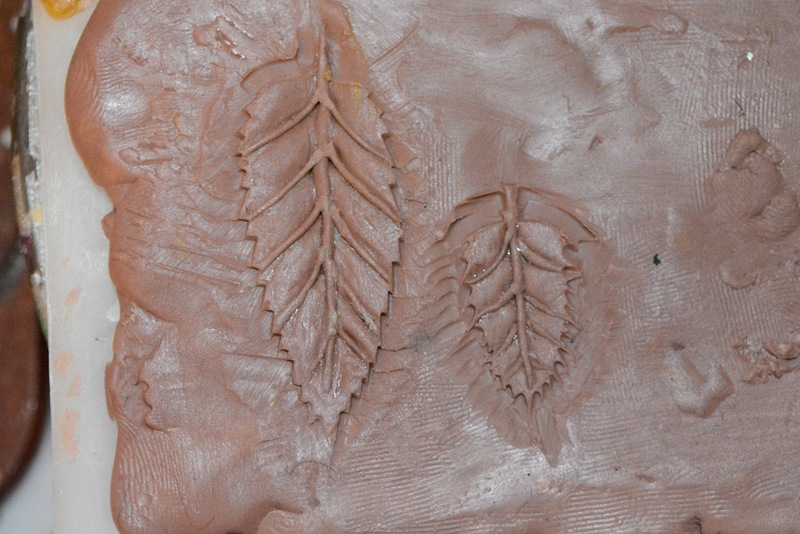 I really like how the leaves match the sculptural style because they are made by your own hand the same way. Thanks! The leaves turned out the way they did because that was the only way I could make them :) But they probably look OK within the context of the story. I'm glad you think they work. Well done! I especially like how the goblin's mouth turned out. The goblin reminds me of one of the trolls from the troll market in Hellboy 2, not that there's anything wrong with that. In my opinion Guillermo Del Toro is right up there with Rackham and Froud when it comes to fantastic fantasy art. Congratulations on the fantastic work as always. 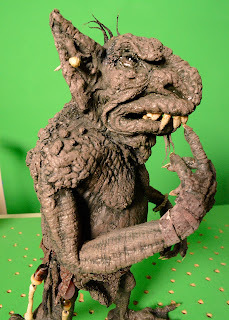 Your goblin does stand out from other depictions of the creature and I think your artistic sensibilities are paired perfectly with fantasy and folklore creatures. Thanks! 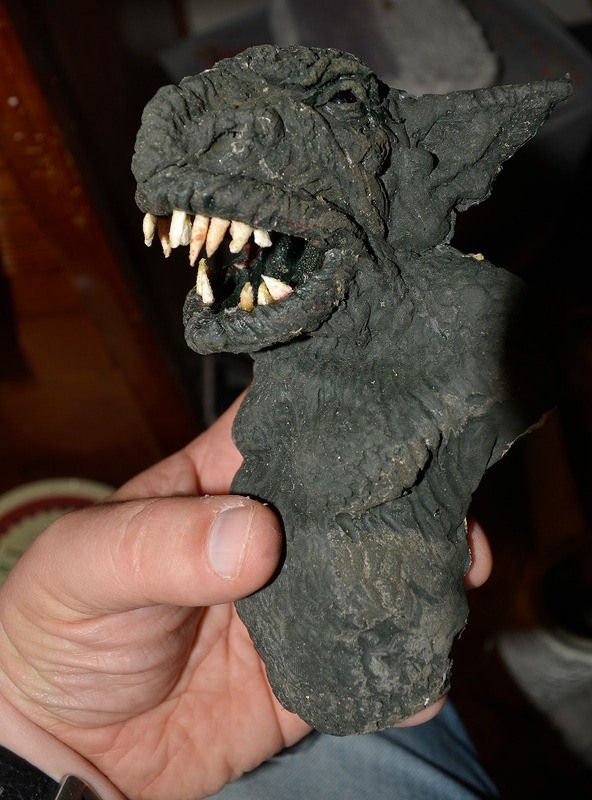 :) It's difficult with very traditional creatures, like goblins, trolls or dragons. Should you do something that is perfectly recognizable or should you try to re-invent the concept with new designs? 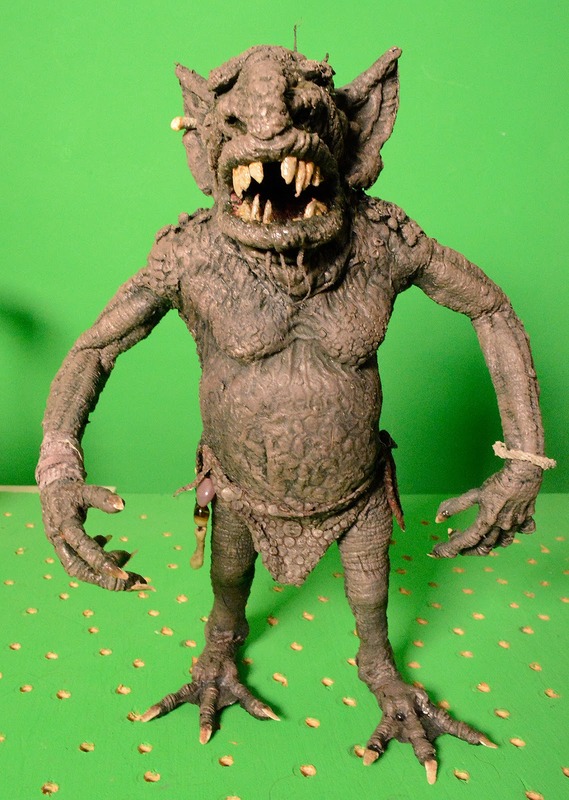 Weta Workshop, for example, has done both. Their cave troll was a very new (and influential) concept, while their Smaug was a very conventional dragon -reminding me a bit too much about Dragonslayer's Vermithrax.